Cynopsis Sports, the leading daily publication for sports media executives, is assembling an unrivaled panel of eSports thought leaders in all aspects of business within the emerging global sporting category. The event, held on Thursday, June 23, in New York City, will focus on authentically marketing the space, especially for non-endemic brands and advertisers, and will feature industry leaders from brands, professional teams, publishers and leagues. Discussion will cover the exploding world of competitive gaming and offer tactics for monetizing the global eSports audience, which is expected to exceed 145M by 2017. 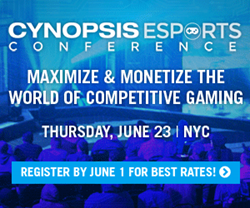 The inaugural Cynopsis eSports Conference will feature keynotes and panel discussions on key topics such as how eSports is changing media, birth of the ELEAGUE, marketing authentically to gamers and fans by targeting the millennial audience (who make up 57% of US eSports fans), eSports trends (presented by Nielsen,) as well as strategies for working with other influencers and celebrities in the space. While the full list of speakers will be unveiled in the coming weeks, the June 23 Conference will feature a lineup of executives from notable companies, brands and teams, including Turner Sports, OpTic Gaming, ESL, PepsiCo, Twitch, Yahoo eSports, Facebook, rEvXP, The Drone Racing League, GameCo, Genius Sports, Magid, AZUBU and Sportradar. Attendees will include non-endemic brand executives and marketers, potential team owners, executive leaders from agencies, content creators, sales-team executives, media buyers, online startups, digital-services providers, and publishers. The Cynopsis eSports Conference, sponsored by rEvXP and Magid, will be held at Three Sixty° (10 Desbrosses Street, New York, NY 10013). Registration is $795 per person, $745 for groups (3 or more) or a table of 10 for $715 per person. For more details, go to http://www.cynopsisesportsconference.com. For questions about registration, contact Sarah Martinez at sarah(at)cynopsis(dot)com or go to http://www.cynopsissportssummit.com. For sponsorship information, contact Vice President of Sales and Marketing Mike Farina at mike(at)cynopsis(dot)com.